Conservation groups not satisfied with new critical habitat boundaries for lynx Obama Touts Energy Progress He Calls Projects In Nevada, "Models"
Recently we ran the story how well Wyoming’s supposedly beleaguered elk population was doing. Every herd in the state was above Fish and Game objectives. It’s a different story for moose, which are only at 44% of objective. We ran a story how the moose were starving and suffering from climate change in NW Wyoming. Bighorn would do better if some domestic sheep allotments on public land were closed. State moose numbers fall short of target. Mule deer count is also below goals, but antelope are going strong, Game and Fish survey shows. By Angus M. Thuermer Jr. Jackson Hole News and Guide. I recently read Joel Berger’s book “The Better to Eat You With”, I think that’s the title anyway… It looks at prey species’ responses to predators in areas where predators and prey have always existed, in areas where predators are recolonizing (GYE) and areas that are predator free. I would highly recommend this read as a lot of research was done on the moose of Jackson Hole. He conducted research in Wyoming, Canada, Alaska, Siberia, and Greenland. If numbers are that low wy have a hunt at all? Ken, while in Alaska last year I got some incredible moose photos. Bull/buck only hunts are just like rooster only pheasant hunts in the midwest. You can shoot a lot of males in a population and still have overall population growth as long as there are enough males to breed the females. Healthy habitat and females are the key to herd growth. Hunting opportunities??? Made me wonder how much the license to kill the last moose in Wyoming will cost? After all might as well use every opportunity – even the last. Now, if you don’t believe this research it in the paper’s archives. However, there is no question the moose population around Grand Teton and Jackson has fallen drastically. Certainly the drought has hit them hard. Moose are having a tough time learning to deal with both the increasing numbers of bears, and of course their new neighbor – wolves. Mother moose are just starting to realize these predators are suddenly a threat to their calves. Another very unfortunate thing is the unbelievable number of moose killed by motor vehicles in Jackson Hole, over Teton Pass, along the Village Rd and the highways through Grand Teton Nat’l. Park. Traffic has increase tremendously and people just refuse to slow down. The powers that be refuse to lower speed limits. We are surely going to be out of moose very soon so doesn’t it seem the first step we should take is to STOP HUNING THEM FOR A SPELL? We did see one young moose on the way back from YNP on Monday – however, it was in Shoshone National Forest and drew a huge jam of cars. I guess people are realizing that to see a moose anywhere is a real treat. Earlier, saw two moose on the way to Cooke City, so I know there are at least three in the forest. Utah is over run with the critters such that they are in our backyards and we ship them off to Colorado. Moose are easy to find and watch in northern Utah where I live. I am not a hunter, but enjoy watching them, spotting them easily on snow covered mountains in the winter. They are painfully easy to find even in the summer. My anecdotal evidence would say there are healthy populations here as opposed to Wyoming. Can anyone speak to the health of Utah populations? 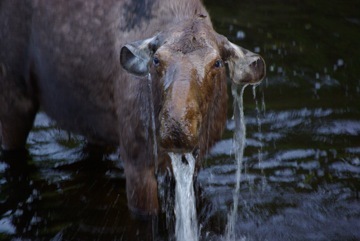 I’m looking for some good moose photos for my website..”moosecense.com”. Would you be willing to share them? Moose are returning to Eastern Idaho, even the small mountain ranges near Pocatello. There are several in the Mink Creek drainages just south of Pocatello. We even saw a big bull moose in the gasp, Pleasantview Hills, one of the most godforsaken overgrazed BLM areas in SE Idaho. It was in a drainage where Western Watersheds Project got the cattle kicked out for a decade. There is just something in NW Wyoming driving the population down, and I guess it is the drought and higher mortality from many sources. jerry b, I’d be happy to share them. Ralph, can you send him my e-mail address. Between Pocatello and West Yellowstone there is a lake near the highway (can never remember the name), it’s always full of swans. Last year I took a picture of three moose in the lake at one time. I agree that hunting should be decreased or possibly stopped “for a spell” as the outfitter put it. Seeing as how that is the only factor we can really control at this point, it seems smart. I wish I could remember my source but I know I read somewhere that the moose population has declined since the fires of ’88 due to the loss of mature forests. That could be an explanation as to why Utah has so many and they are moving into Idaho for better habitat. Have there been declines in other areas? Moose are browsers and do well in burned areas. In AK where I grew hunting moose, they love the new alders etc, but I would be willing to guess the 20 yr old timber has finally out grown the moose’s browsing ratio. From what I have seen of Utah moose country its covered in Huckle brush (redneck term for random browse that I’m not quite sure what species of lol) I would be willing to guess that wolf predation plays a rather large role in Moose population losses. Moose are an easier prey species than an elk, because they are mostly solitary and not espically fleet footed when compared to an Elk. lol. Wouldn’t having the animals disappear not allow for hunting opportunities? Ryan, (or anyone else) are the populations of moose going down in Montana or in Idaho where there are also wolves? I ask this because of the fact that the two species have evolved to coexist and while wolves could have some impact I would be surprised if they killed off that many. Plus with as opportunistic as wolves are, they are probably going to hunt more of what is available, which is elk. I had heard that the long period of drought plus the ’88 fires, which drastically changed moose habitat, are some of the principal causes of low moose numbers. I’ve also heard that moose in Minnesota and Wisconsin, prime habitat, are mysteriously dying. Since moose are so susceptible to heat and we are at the southernmost tip of their range, I am wondering if these numbers are not more a reflection of those factors, rather than predators, although wolves are now something moose have to deal with that they didn’t here before. Is there anyplace to look at the moose numbers on a chart over the last, say, 15 years here? On a good note, in Sunlight I have seen quite a few moose this year. In fact, one cow walked into my front yard this afternoon. Also, I would have to wonder how easy a moose is to take down by wolves. They are pretty tough animals. The horses across the pasture get really spooked when one moose walks through, but could care less about the elk. I wouldn’t want to mess with a moose, for sure. Also, they tend to hang in habitat that would be hard for wolves to take prey down, I would think. Marsh, lots of willows and cover. The cattle in my valley that roam in the forested areas never get killed by wolves, while the ones in meadows do. We have a lot of moose in north Idaho, but we are seeing more wolf kills on moose. I had a yearling this past winter get taken down by a pack of 4 wolves that frequent my property. Winter is the hardest for moose and the easiest for wolves. It’s a lot easier for the wolves to take down a moose in deep snow and that seems to be the places we find the most wolf kills on moose. The moose seem to stay higher on the slopes than elk or deer and we are wondering if the wolves might not be finding it easier to take a moose in deep snow versus trying to run down an elk or deer hanging out down lower where the snow is not quite as deep. That is interesting. Last winter I did come across a moose kill, probably from wolves. This winter I watched the a cow and calf moose hang out all winter in the riverbed right by the meadows that a pack of 5 wolves use as their ‘freeway’ between two draws. From what I can tell, the wolves here do concentrate on the elk, but I live in elk overwintering grounds, so maybe there are just so many elk here (about 1400 in the valley) that the wolves have specialized. Moose become vulnerable in the winter, especially when they burdened by high tick infestations. If you see a moose up close in the winter, it can be pretty sad and disgusting too. Leslie, I would say that the fact moose are dying in Wisconsin and Minnesota probably is due to heat sensitivities due to global warming. Those areas, in particular, Minnesota, have never had their wolf populations extirpated like they were here in Wyoming. Also, cobra, I have read the same thing about wolves attacking moose in deep snow like that. It seems that would be one of the only ways wolves could take down a big Yukon moose. ProWolf, I wondered about the disease (forgot its name) that affects whitetail deer and kills moose…if that might be the reason for the dieoffs in Minn. and Wisc. One of the students doing elk studies here this winter was from Wisconsin and told me about these die-offs. The studies I’d seen previously by Doug Smith put the moose predations quite low. What are the recent numbers in the Park? Moose are not doing poorly throughout Wyoming – the Snowy Range moose are doing well enough to have crossed the Laramie Valley and colonized the Laramie Range and last I heard the Bighorn moose were doing OK also. A variety of diseases may be having more impact than previously thought in NW Wyoming, including winter tick and arterial worm infestations. In the study above, predation was not a major cause of mortality, at least in adult moose. And to Leslie – the disease (parasite) you’re thinking about is meningeal worm. But the last journal article I read was placing blame on global warming/climate change, at least for Minnesota – moose are incredibly well adapted to cold weather, and incredibly poorly adapted to warm weather, and seem to be sensitive to even minor increases in summer temperatures. We had a thread after a post on this very thing at the end of March. So far no one has discussed why bighorn and deer are down, and pronghorn up. Note that we also had recent article and discussion about the fact that elk are above objective in every hunted herd in Wyoming. Thanks Ralph and TC for the clarification. I wonder if in the long term wolves would actually be helpful to moose because they herd elk out of the bottoms and from demolishing the willows. Can’t do much about warming and drought though. It might, although I think the real problem with NW Wyoming moose is the aftermath of the fires of 1988 and after which burned the sub-alpine fir the moose need. I don’t know about montana, but I know that moose numbers have dropped in ID in several units cohabitated with wolves. (tag numbers have been cut significantly). Moose also get diseases from Whitetail deer which seem to be growing in population across the west. Other than that we saw a lot of everything, nice to see so many Pronghorn this year they are doing well. Seems like the Elk numbers are growing in number up in the Lamar too. The Coyote population is really high, saw one kill a Buffalo calf the 28th at the pullout looking at Speciman ridge. Also seen a Coyote chase a Black male Wolf down the Lamar valley. Also seen 3 Grizzlys, 6 Black bears,Foxs, Bighorns, Mountain Goats, Mule Deer, Badgar, Otters, Bobcat and first time ever a Cougar. Great week to be in the park, weather was great wish I could have stayed a few more weeks to see the Elk start calving and the Gizzly/Wolf action pick up. Craig, I need to go to Yellowstone with you! I hardly ever see that much. The most bears I have seen in one day is two. I have been lucky enough to see moose the last two times I was in the park (albeit at a distance) both big bulls. Ralph, in regards to deer and bighorn sheep numbers, is there any disease that affects deer that is going around that elk aren’t affected by? I would think chronic wasting disease could be a factor but I know elk are far from immune to that. Are bighorn sheep being affected by domestic sheep diseases? Oddly enough, I have seen more bighorn sheep since I moved to Wyoming than I ever saw living in Montana. Is there any factor involved with introduced mountain goats? I know mountain goats and bighorn sheep coexist in a native state in places like Montana but not in Wyoming. Also the Cow Moose wih the Calf had a lot of patches of hair missinng down to the skin. Not like normal shedding of a summer coat! Wish we could post photos here.